С помощью функций Advanced Rename вы можете построить новые имена файла путем добавления, замены, случайной замены, или предоставить файлу новое имя, на основе известной информации о файле. Режим эскизов позволяет отображать картинки непосредственно в списке файлов,что дает вам максимальный контроль над процессом переименования. 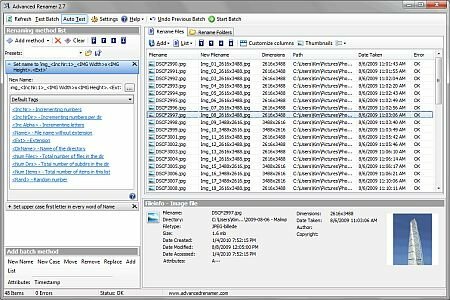 Advanced Renamer is program for renaming multiple files or folders at once. It can use several different methods for calculating the new name including multimedia tools for sound and picture files. Advanced Renamer makes it easy to set up an advanced batch job using multiple methods on a large amount of files. The eight different methods make it possible for you to change the names, attributes and timestamps of files in one go. With Advanced Renamer you can construct new file names by adding, removing, replacing, changing case, or giving the file a brand new name based on known information about the file.